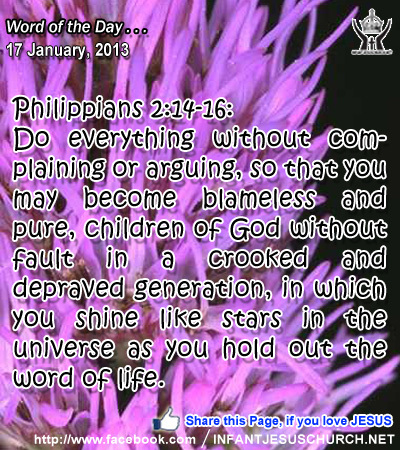 Philippians 2:14-16: Do everything without complaining or arguing, so that you may become blameless and pure, children of God without fault in a crooked and depraved generation, in which you shine like stars in the universe as you hold out the word of life. Heavenly Father, the unbelievable vastness of your universe, with its billions of stars, exceeds our limited comprehension. But we thank you for calling us to be a place of light in the dark world around us and we pledge to shine your light today in the lives of all those we might. Through the name of Infant Jesus we pray. Amen. 40And a leper came to him beseeching him, and kneeling said to him, "If you will, you can make me clean." 41Moved with pity, he stretched out his hand and touched him, and said to him, "I will; be clean." 42And immediately the leprosy left him, and he was made clean. 43And he sternly charged him, and sent him away at once, 44and said to him, "See that you say nothing to any one; but go, show yourself to the priest, and offer for your cleansing what Moses commanded, for a proof to the people." 45But he went out and began to talk freely about it, and to spread the news, so that Jesus could no longer openly enter a town, but was out in the country; and people came to him from every quarter. Today’s Gospel we the leper who did something quite remarkable. He approached Jesus assertively and humbly, expecting that Jesus could and would heal him. Normally a leper would be stoned or at least warded off if he attempted to come near a rabbi. Jesus not only grants the man his request, but he shows the personal love, compassion, and tenderness of God in his physical touch. The medical knowledge of his day would have regarded such contact as grave risk for incurring disease. Jesus met the man's misery with compassion and tender kindness. He conversed the love and mercy of God in a sign that spoke more eloquently than words. He touched the man and made him clean - not only physically but spiritually as well. How do we come up to those who are difficult to love, or who are shunned by others because they are misshapen or have some disease? Do we show them kindness and offer them mercy and help as Jesus did? The Lord is always ready to show us his mercy and to free us from whatever makes us unclean, unfriendly, or unloving towards others. Loving Infant Jesus, inflame our heart with your love and make us clean and whole in body, mind, and spirit. May we never doubt your love nor cease to tell others of your great mercy and compassionate care.